Born in Sofia, Bulgaria, Ivan Kristoff’s interests have aimed at blending new heights in photography with new dimensions in his vertical operations. Ivan’s passion for helicopters, paragliders and motorcycles illustrates his never abiding focus on pursuing the element of danger. “I live to be challenged. I love pushing the extreme and living on the edge.” The photos exhibit how Ivan‘s love of mountain climbing and paragliding have resulted in breathtaking aerial photographs. 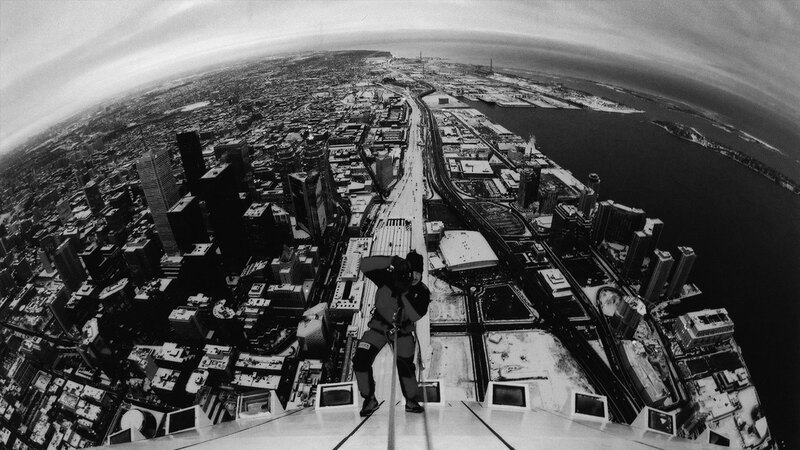 His first exhibition was at the HART House of the University of Toronto, when he was a student and showed unique images of his rope access work at extreme heights. Technology allows Ivan to capture the element of danger of his challenging projects. He gives us a “bird’s eye view” of his operations. This remote photography perspective gives the observer a unique view from an angle that captures a stunning picture of the vertical environment. Internationally known for his bold projects and cutting-edge use of technology in inaccessible places, Ivan continues to be an experimenter and pioneer.His innovative photographs reveal his interest in documenting innovative aerial and technical operations. 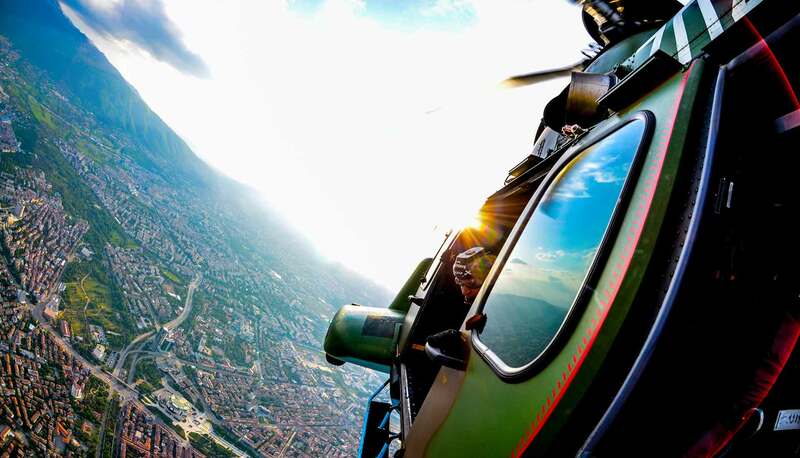 Among the many projects, Ivan has rappelled and climbed from Eurocopter, Mi-17 Bulgarian Tactical Aviation, Police and private twin-engine helicopters. Ivan’s priority millennium project is to self-test how during emergency crisis civilian and government helicopters can be employed in innovative aerial operations for vertical rescue. The secret of his success is the ability to never accept conventional thinking and traditional routes in achieving his goals. As a member of the Nikon Professional Services (NPS), Ivan is among the international elite group of Special Nikon Photographers. Ivan Kristoff is a visionary artist. His photos illustrate his motus vivendi. They exhibit vividly how Ivan’s love of remote access and aerial photography have resulted in breathtaking pictures involving his ability to go where no man has stepped before.When you are up in the air, a few hundred meters off the ground, you want to rely on the right equipment. For high-rise photography, Ivan Kristoff relies only on his Nikon cameras. Ivan Kristoff’s interests have aimed at blending new heights in photography with new dimensions in his vertical operations. Ivan’s passion for helicopters, paragliders and motorcycles illustrates his never abiding focus on pursuing the element of danger. “I live to be challenged. I love pushing the extreme and living on the edge.” His photographs illustrate his motus vivendi. The photographs vividly exhibit how Ivan‘s love of mountain climbing and paragliding have resulted in breathtaking aerial photographs. 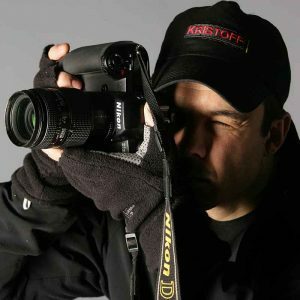 Ivan Kristoff is an action photographer who has won international renown for his innovation in rope access work and aerial rescue initiatives. He has accomplished his achievement on the tallest structure in the world, while studying at the University of Toronto. He has a Bachelor in Science and now is studying Masters Degree on Advertising and Brand Management at the New Bulgarian University. Kristoff has created a number of exhibitions on rope access and aerial operations, including one at the Dubai Helishow 2010. His technical demonstrations, lectures, presentations, essays and articles on vertical and aerial operation, has placed him at the pinnacle of her field. 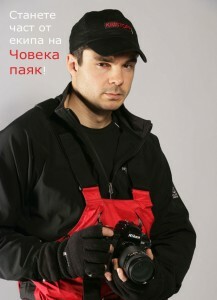 He is an expert in special shooting sessions, trips, logistics, video production and extreme sport sessions. He has journeyed far and wide across the world over the past decade. “I am addicted to travel, I’m a full-time dreamer, and I really love extreme sports,” he says. When it comes to digital processing, he prefers the Nikon equipment and Lenovo Thinkpad. “The Thinpad is a very important piece of equipment for any photographer who needs to develop, manage, and process photos. This is why your choice is so important: It’s monitor shows the color rendering of every photo before it’s printed. This means that it’s necessary to have an adequate visualization tool to deliver quality and ensure the photographer’s creative ideas aren’t lost on the journey from click to print,” says Kristoff. That’s what the Canadian Spiderman set out to prove in his latest shoot. Over the last decade Ivan Kristoff has been flying high in the air in order to capture some unique aerial combat training shots. This year he is achieving new heights in the air – with the best aviators, he has ever met. The new photo session and location scouting for a documentary film for the Bulgarian aviation, features some pilots and airborne rope access experts hanging off unexpected aerial settings. “The idea was to shoot aviators in situations where nobody would expect them,” says Kristoff. “A lot of aerial shots look very similar. The idea of this shoot was to try to capture something really different”, he adds. Working in extreme location at extreme heights is a challenge. I have to improvise with the safety procedures and explore new ways for film making. Ivan will use the new Samsung tablet with the Microsoft 8 Surface, along with his Microsoft mobile smartphone for the shoot. Then he will follow his maxim of ‘being in the right place at the right time and doing the right thing’. Kristoff has been working on this idea for over 10 years. The concept for each image had been worked out in detail and will be sketched by the the Microsoft 8 Surface tablet. The Bulgarian/Canadian photographer has only praise for everyone involved. “I want to thank Radoslav Nikolov of Microsoft Bulgaria and all my friends for making it possible!”, he says. To enter a competition to win one of Kristoff prints, click here. Ivan Kristoff ’s solutions for operations at extreme heights, emergency response and rescue applications have played an important role in the exploration of verticality and setting up new trends in the suspended access environment. He contributes to the development of innovative procedures for rapid deployment of emergency responders from ENSTROM 480 B light turbine helicopter and MI-24, the world’s fastest helicopter. His team of aerial response specialists have extensive experience in extreme conditions. Ivan Kristoff leads the way with his aerial images. This photo depicts his passion for visual expression and describes best his extreme sports and volunteer rescue activities. Nearly 10 years ago Ivan Kristoff stepped firmly on top of the world’s tallest structure. As work at extreme heights entered the mainstream, Ivan was at the forefront to tell the stories of many achievements in the vertical engineering. American, Canadian, Arabian and other TV stations from all over the world have turned to Ivan to bring them startling and memorable video coverage of his world records and special events. 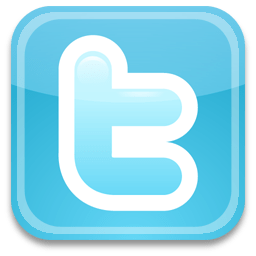 He has also worked with companies such as Cannon, Nikon, Sony Ericsson, IBM, Traser and Fortis Swiss watches and Nike, to shape advertising campaigns. Ivan Kristoff”s profession as a rope access technician has taken him to the top of some of the tallest structures on the planet. His journey as a volunteer aerial rescuer and addiction to the high adrenaline and places has made him do things that others have not done in the air. His photographs were exhibited in galleries around the world, as well as in magazines and newspapers. Through his work Ivan shows places where no one has been before. Now he holds workshops throughout Europe and MENA. He is also making a documentary film on the 1ooth Anniversary of the Bulgarian aviation and writing a book that tells the stories behind some of his most powerful images. Ivan is one of the most recognized remote access photographers. He has photographed a wide array of assignments, including rock climbing in Caucasus, Georgia, surfing in Dominican republic, freight-train hopping in Bulgaria, paragliding in America, and rock climbing in Canada. His safety work includes assignments for Discovery Channel. Corporate/commercial clients include Nike and Tracer Swiss Made Watches. 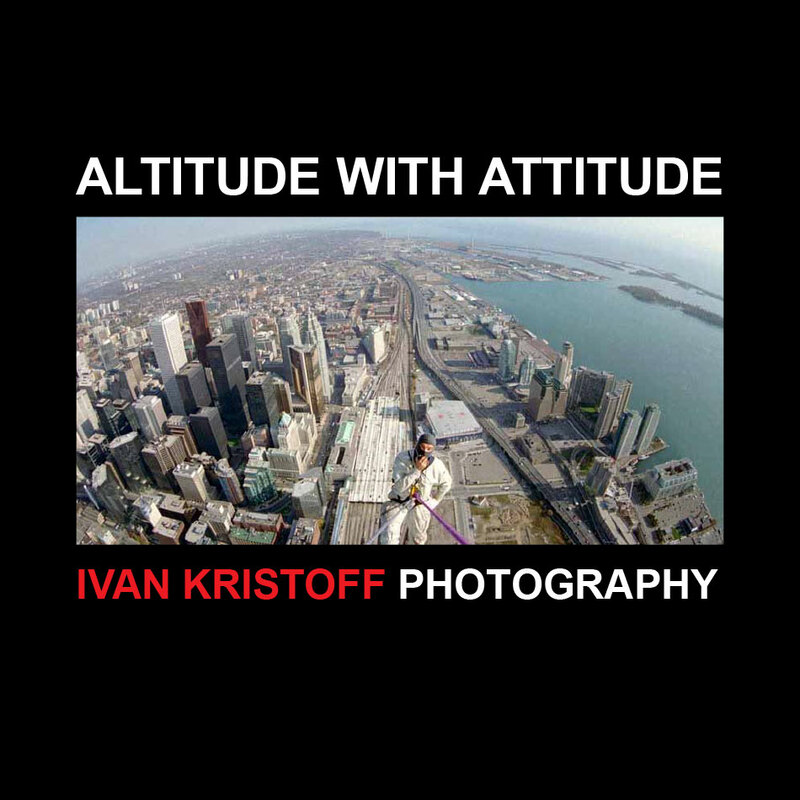 His first book, Altitude with Attitude, will be published soon in Canada. Today, much of his time goes into capturing both still images and video for the creation of multimedia projects for commercial and editorial clients. Kristoff uses Nikon equipment to ensure he gets the right shot under the harsh outdoor conditions of extreme sports. Ivan Kristoff and aviators started working on a series of short films with Nikon cameras and documentaries for the stunning and extraordinary work of emergency services around the world. This is a teamwork of air crew men, who would like to create an action-packed and informative visual presentation of their profession. The music is composed by Kiril Milchev. Extreme videography at extreme heights. High above the ground, or high above the clouds -meet extreme photo/videoаgrapher, Ivan Kristoff, filming and HD broadcasting from the air. His next special event will be in Toronto and showcase cutting-edge film making and IT communications. 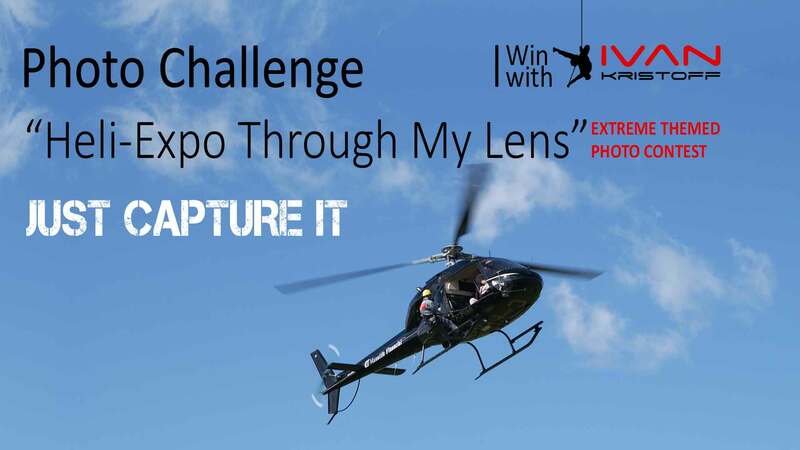 15+ years of extreme activities captured on Nikon camera. The Canadian Spiderman, Ivan Kristoff, has been synonymous with attractive photography for more than 15 years. It all stared when Ivan started extreme skiing and paragliding in Whistler, BC, Canada. He carried his camera while ice climbing before skiing downhill or flying with his skies and paraglider from the summits of Blackcomb Ski resort in Canada and around the world. Later Ivan changed his vertical nature environment for the urban high rise surrounding in Toronto, Ontario. Wherever he goes, he continued to carry his Nikon photo equipment, while hanging on ropes or up in the air, or conducting helicopter rope access operations. Now Ivan Kristoff has gathered a team of extreme skiers and snowboarders to film a new breed of visual documentaries of extreme winter sports. The first series of this action sports film is called “White Off”.